The Juggler is a character who seems to have been intended as one of the rewards for completing the Main Quest, judging by her CS editor id of SE14Juggler. She doesn't appear in the final game, however, which might explain the odd race and class: she is a member of the unused Vampire Race, and she has the CharactergenClass given to you during the tutorial. She would have worn a lower-class outfit consisting of grey trousers, brown tunic and orange loafers. 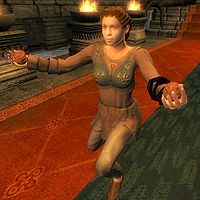 Naturally, from her name, she featured a similar juggling animation to Thaedil, and would also have been seen juggling while in conversation mode. She can be found in an inaccessible test cell called The Waiting Room. Like Thaedil, the Juggler's balls would have been purple, achieved by the absence of a texture for them. The texture provided by the Unofficial Shivering Isles Patch for Thaedil similarly would have also worked for the Juggler. This page was last modified on 10 March 2019, at 07:25.